My wife picked up a pile of pocket schedules while she was out in the valley visiting her father. 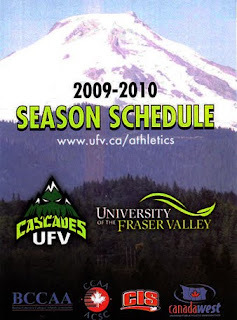 Among them was the University of the Fraser Valley athletics schedule which has one of the coolest logos I have seen in a long time. Its a menacing looking mountain with trees for teeth and ice for eyes. It kind of reminds me of one of my all time favorite logos the Prince George Spruce Kings which depicts an angry Christmas tree being chased by a saw blade - awesome!